I am back from a two-week-plus mission trip to the Pacific Northwest and the West Coast, which included preaching in two cities, leading a three-day retreat, and speaking on a panel about the role of religion in addressing global climate change. Arise. I love you. I need you. I am calling from the trees, from the wind, from the very stones beneath your feet. I am calling from the orcas and the salmon, from the black bear and the mountains, from the fig trees and the vines. I am calling from the strangers who are not really strangers, but brothers and sisters you don’t yet recognize, those who are suffering right now from a wounded Earth and a changing climate. I am calling from the future, from the men, women, and children who will inhabit this planet long after you are gone and who depend on you to leave them a habitable world. Arise, my love, my fair one, and come away. 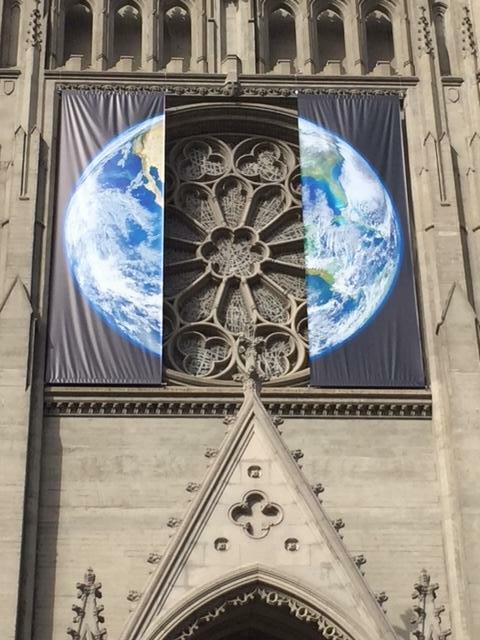 Grace Cathedral, San Francisco, adorned with Earth banner. 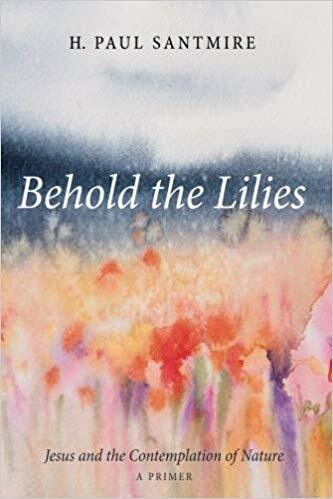 • At Grace Cathedral in San Francisco, I attended faith-based workshops affiliated with the Global Climate Action Summit, a three-day event convened by Governor Jerry Brown. Workshop topics ranged from the ethics of climate geo-engineering to how to speak to evangelical Christians about climate change. I spoke on a panel with Creighton University’s Professor Richard Miller and Eco-America’s Meighen Speiser. 1. Restore a park and revive your soul! Our diocese’s much-anticipated Revival will be held on Sunday, October 21, with festive music and prayers, and preaching by Presiding Bishop Michael Curry ( order your free tickets now, if you haven’t already!). Revival EAST will begin at 5:00 pm at the Hanover Theater (2 Southbridge Street) in Worcester. A procession to the theater will begin at 4:30 p.m. from Fuller Park. Would you like to help clean up the park beforehand? Arrive at 10 a.m. on Sunday morning at Murray Avenue (behind the YMCA on Main Street) and join the cleanup crew that will be praying for the park and its neighboring communities, and restoring the park as sacred space. Because of the risk of needle debris, this is an adults-only event. Please wear close-toed shoes and bring work gloves. While you’re at it, you might bring along a rake and heavy-duty trash bags, too. For more information, contact the Rev. Meredyth Ward . 2. Pledge to deliver a sermon in solidarity with “the trial of the century”! The United Church of Christ invites you to add your prophetic voice to a sermon campaign supported by over 20 organizations of different faith traditions. What news outlets across the country have called “the trial of the century” will begin on October 29. Twenty-one children and youth have sued the federal government (Juliana v. United States) over its role in causing climate change and violating their rights to life, liberty, and property, while also failing to protect essential public resources. 3. Celebrate the first week of Living the Change with a special event, October 7-14! Living the Change is an extraordinary, multi-faith, international movement for changes toward sustainable living. Please visit the website for Living the Change as you consider your own commitment to make faithful choices for a flourishing world. The three choices that make the most difference involve transportation, household energy use, and diet. Commitment: Making a personal commitment to sustainable living, and sharing about it. Celebration: Celebrating this together through an Earth-friendly, vegan community meal. For more information and to register your event at Living the Change, visit here . 4. On October 27, vote at our Diocesan Convention (or urge your delegation to vote) for the resolution, “Creation Care in Our Congregations: Living Lightly on God’s Good Earth.” Sponsored by our diocesan deputies to last summer’s General Convention, the resolution affirms our diocese’s commitment to Creation care and calls on all parishes to create a “green team” and to undertake an energy audit. You can download the resolution here . • Studies show that although many people are concerned about climate change, few people talk about it. Now is a good time to start having these conversations. To inform (and ease) our efforts to hold productive conversations around the greatest challenge that human beings have ever faced, EcoAmerica releases “talking points” every couple of months. Eco-America’s August 2018 Talking Points are devoted to making the connection between extreme weather and climate. You can download the issue here . Kristin Barker (Co-founder and Director, One Earth Sangha), the Rev. 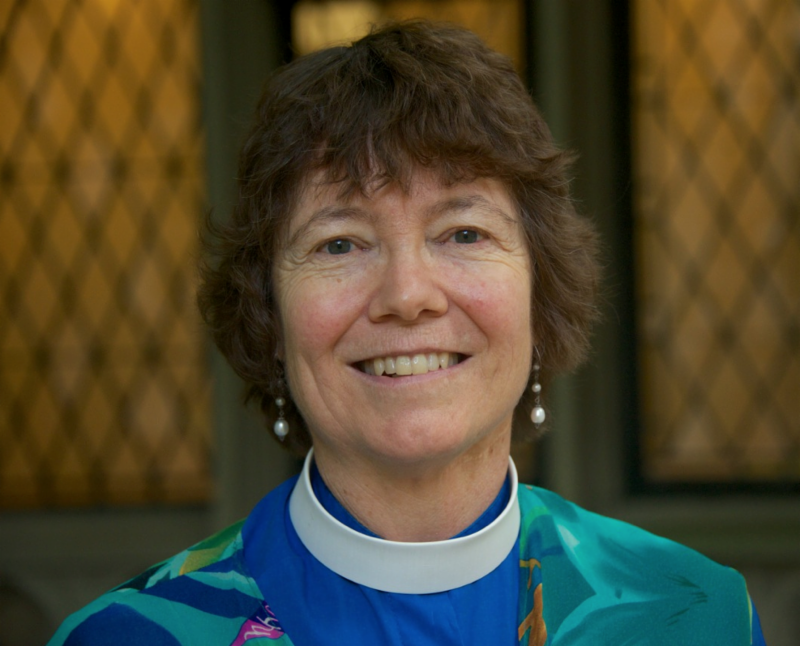 Dr. Margaret Bullitt-Jonas, and the Rev. 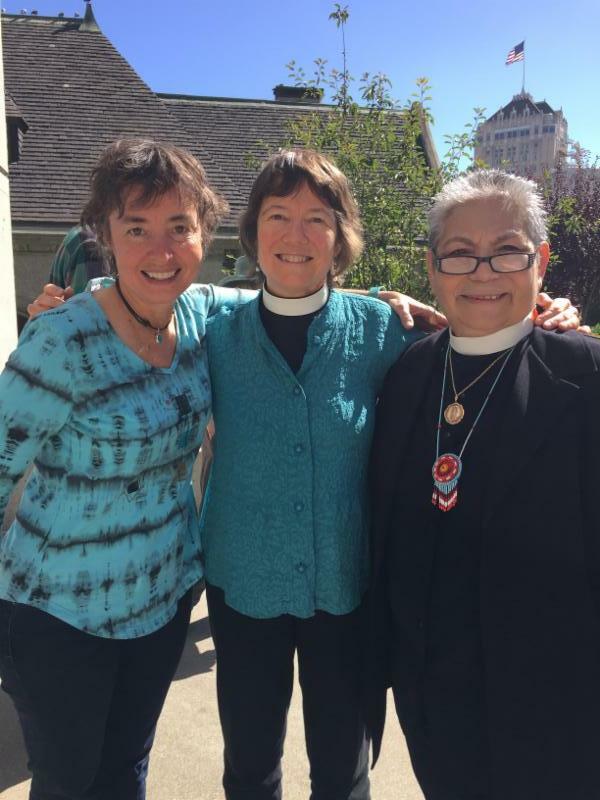 Virginia Marie Rincon (the Episcopal priest and Native American who drummed the opening processional of the Multi-Faith Service of Wondering and Commitment) in San Francisco. • In case you missed it, here is some good news from last month’s newsletter: You can get a weekly eco-tip for your parish newsletter or bulletin by visiting Episcopal Climate News . This is an easy way to weave Creation care into the life of your congregation. The unofficial climate-change and environmental communications hub for Episcopalians and other Christians! Living the change is possible. We want to share with you inspiring stories of change by upstanders and early-movers from many world religions. Will you become one of them? If you've enjoyed this newsletter, please feel free to forward to one or two friends you think may be interested.